Warrington Wolves achieved the first win for an English club over Australian opponents since 2012 as they beat Brisbane Broncos in the first match of the 2017 World Club Series. Kevin Brown excelled on his Wire debut, scoring a try in the second minute. Ryan Atkins and Matty Russell helped the hosts into a 20-0 lead and Tom Lineham also crossed before half-time. Declan Patton added 11 points with the boot, while Corey Oates, James Roberts and David Mead replied for Brisbane. 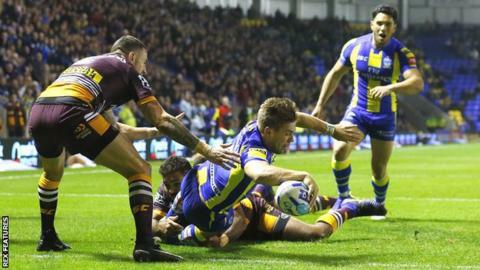 Leeds' World Club Challenge win over Manly five years earlier had been the last time a northern hemisphere side had beaten one of their NRL counterparts, and Super League clubs had lost all six matches since the expanded World Club Series began in 2015. Super League champions Wigan Warriors host NRL Grand Final winners Cronulla-Sutherland Sharks in the World Club Challenge on Sunday (15:00 GMT). Brisbane, coached by England boss Wayne Bennett, do not begin their league season until 2 March and a lack of match practice appeared to contribute to their slow start, for which they were clinically punished. Warrington made the perfect start when Joe Westerman raced 60 metres after charging down a kick and Brown, a winter signing from local rivals Widnes, darted over after Westerman had been hauled down short of the line. Last season's beaten Super League finalists were 20-0 up after 19 minutes as Atkins powered over and Russell showed neat footwork to evade three Brisbane defenders. Oates went over acrobatically in the corner for the Broncos but winger Lineham's score for Warrington, given after consultation with the video referee, helped the Wire to an 18-point lead at half-time. Brisbane improved after the break and Roberts' 80-metre dash for a try gave the Australian side some heart, but Patton's drop goal and a fifth successful kick from the tee established a three-score advantage which was rarely threatened. "We wanted to get Super League off to a good start. Not too many people gave us a chance but we know the belief in our squad and it was good to put a good performance out. "I felt like our ball control was good, especially in that first 20 minutes, and our kicking game was great. That's a great way to kick-start our year. "We wish Wigan and Cronulla all the best for Sunday. I had 11 or 12 great seasons in the NRL and I love that competition. May the best team win, but hopefully people will look a little bit differently at Super League after that result." Warrington: Gidley; Russell, Evans, Atkins, Lineham; Brown, Patton; Cooper, Clark, Sims, Hughes, Savelio, Westerman. Replacements: Westwood, Livett, Philbin, Dwyer. Brisbane: Boyd; Oates, Roberts, Kahu, Mead; Milford, Hunt; McGuire, Gillett, Thaiday, Ofahengaue, Ese'ese, McCullough. Replacements: Glenn, Pangai Jnr, Arrow, Fai.